Still Life (winner of this year’s juried SLIFF interfaith award) is about loneliness and death, two topics most films and most people try not to think too much about. Even when films go after such downbeat material, they often treat it glibly. Still Life is a counterexample. Still Life is sincere. Very, very, almost oppressively sincere. John May’s government job is to search for living relatives, or failing that, friends, of people who are found deceased and alone. If he can find no one he arranges their funeral for them, often picking out the religious denomination of the ceremony, the music and the coffin (or urn), himself. He even writes the eulogies, based on photos and objects around their homes. John is working on a particularly tough case, a relatively unlikable and probably abusive ex-military, ex-convict, ex-husband named Billy Stokes, when he finds out this will be his last case. His job is being made redundant. His facile boss points out that John is notoriously slow and expensive anyway, what with his ‘excessive’ respect for the dead. Mr. May decides to go the extra mile, and manages to track down clues that take him to many who knew Stokes, including coworkers, lovers, fellow soldiers, bums and even his gentle daughter, Kelly. 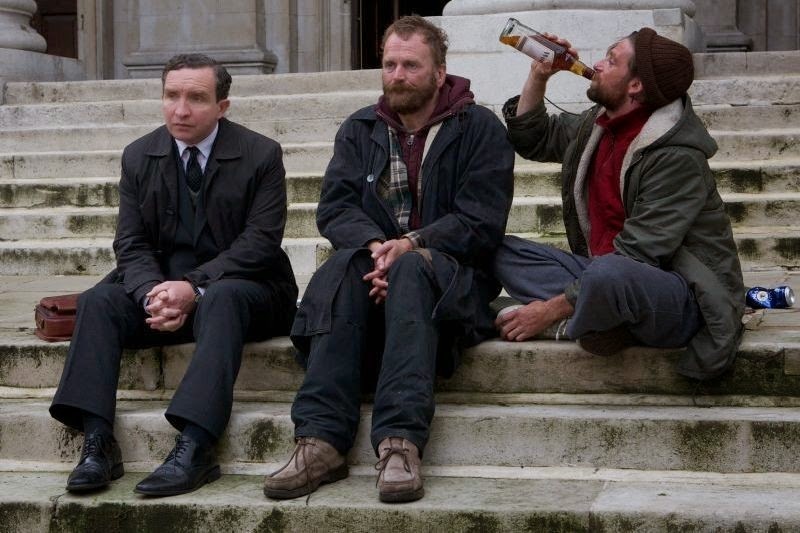 Both Eddie Marsan, who is sadly all-too-frequently typecast as a thug or villain, and Joanne Froggatt, who I love from Downton Abbey, give extremely sensitive and note-perfect performances. Though Still Life is a bit too monotonously respectful and gloomy for my taste, it does have occasional moments of quiet, graceful humor that worked consistently well. In fact, the film takes almost no missteps until it almost falls off a cliff at the end, with a twist that is clearly supposed to be bittersweet irony, but instead struck me as distastefully cheap. It sets up the films undeniably poignant conclusion, but my mood has been too poisoned by the tonal cost to fully appreciate it.